Stash and Burn is a very fun knitting podcast hosted by Jenny and Nicole. They talk about knitting from a different point of view. Stash management! Their episodes are always funny, especially their Halloween episode with two knitting horror stories (the danger of super sharp double ended needles, and OMG what did her mother in law do with that scarf?!). Also, they're huge Battlestar fans and love Buffy! I've really enjoyed listening to them and getting caught up on their episodes. I've actually had to limit myself to listening to one episode per day because otherwise I will get caught up and be sad to only get one episode per week. I've been inspired to get better organized with my own stash. 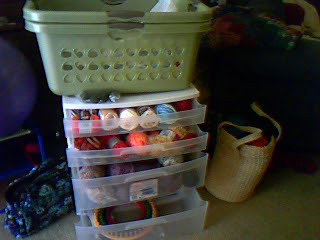 I purchased an organizer, and was dismayed to find that not all of my yarn fit in it! To the right I have the basket Sam gave me for Christmas last year, which is holding all the yarn for current projects, or projects that are for Christmas presents. To the left is my brand new backpack I purchased for myself to carry 2 more portable projects around. 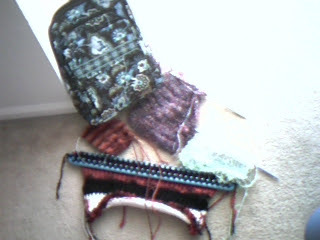 And here is a picture of my current projects. Barely visible is a scarf for a friend of mine at work. Its very pretty lime green, baby blue and pink fun fur with a baby blue fuzzy yarn. 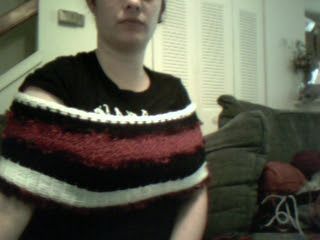 Also, I've made some more progress on my scarf and a VT Scarf for another co-worker. On the knifty knitter is a creation I'm making up as I go for my friend's daughter. *edit* YAY Finished object! This I think will look very cute over a black dress, or with a tanktop and jeans (and of course on someone a little bit smaller than I am) Luckily, the recipient is 13.